Horror has always been largely considered a niche genre in the film industry, relegated to the fringes and often ignored by critics when awards season comes around. And for the most part, it’s easy to see why. Most horror movies are low-budget schlock-fests that usually just cater to a certain type of audience; mainly those who just want to have a good scare while in the theater. But, that notion can be challenged whenever a filmmaker undertakes their own spin on the genre and creates a masterwork that includes all the elements typical of the horror. Such is the case with the series of movies based off of the Horror novels by Thomas Harris. The books themselves are hard to pin down genre-wise. They follow the same principal outlines of most popular crime novels, but are at the same infused with Grand Guignol imagery that gives the readers a very macabre picture of the crimes the stories are focused on. Obviously, adapting Harris’ novels to the big screen would require very careful direction to get the twisted tones right, which is something that this particular series has thankfully benefited from; for the most part. But of course it’s not just the visuals and the plotting that has defined the franchise. Each of Harris’ novels are their own standalone mysteries, but they’re linked together by the presence of one of the most memorable characters in literary history; and the main reason why this series has become as popular as it has. That character of course is the notorious cannibalistic serial killer, Dr. Hannibal Lecter. Hannibal is unique among popular franchise characters. While most series tend to focus on their heroes, the Hannibal Lecter series is one that’s centered entirely around it’s villain. That helps to classify this series within the horror genre, because most horror franchises also center around their antagonists; such as Jason Voorhies and Freddy Kruger to name a few. But, even among his horror brethren Hannibal is unique. He’s intelligent, perceptive, cultured and above all else, seductive. These character traits are particularly what makes him so terrifying. No other character in film or literature has made evil seem so refined and appealing. Like a well hidden predator, he lures you into a false sense of comfort with his graceful nature, but once he’s got a hold of you, then the savage animal is unleashed. And boy, Harris’ novels and the movies they’ve inspired have not shied away from some of the gruesome details. 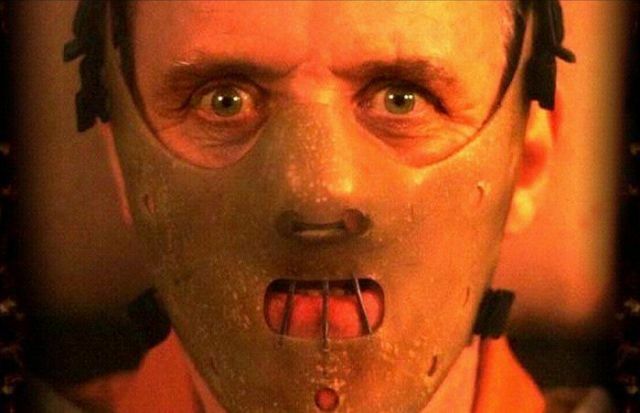 Indeed, Hannibal Lecter has deservedly earned his place as not just one of the horror genre icons, but also as one of cinema’s overall greatest characters. Thus far, Thomas Harris has written four novels around the character and that has in turn spawned five film adaptations. Though Hannibal is featured in all five movies, it’s the three that star legendary Welsh actor Sir Anthony Hopkins which stand out as the most notable. And though Hopkins had the most influence in defining the screen presence of the character, he was not the first to play the part, nor the last. I will be looking at the franchise as a whole in this retrospective (remake and prequel included) to get a good sense of how the series evolved over time and how it ended up becoming one of the most defining series ever in both horror and cinematic history. Dr. Lecter’s first appearance on the big screen came in the form of this adaptation from Thomas Harris’ first novel, Red Dragon. Director Michael Mann, coming off of his stint as the producer and showrunner of Miami Vice, undertook the daunting task of adapting Harris’ gruesome work to the big screen. Part of that process included stripping down some of the more horrific elements of the novel, and instead focusing more on the characters and the investigation central to the plot. As a result, Manhunter plays more like a thriller than as a horror movie. That’s not to say that the film is any less effective. Indeed, it actually works perfectly as it is, mainly due to Mann’s assured direction, which is not flashy and is consistently well-paced. The story follows FBI profiler Will Graham (William Petersen) as he searches for a deranged serial killer named Francis Dollarhyde (Tom Noonan), aka “the Tooth Fairy” killer. Graham, who runs into a lot of hurdles trying to identifying his ruthless target, takes the unorthodox approach of soliciting help from a former colleague and now incarcerated felon Hannibal Lecktor (Brian Cox), who understands more than Graham the mind of a killer. Michael Mann did an admirable job of adapting the novel, but at the same time it’s not all that groundbreaking; it just stands as a solid crime thriller. Petersen makes a good lead, and Noonan in particular steals the movie as the “Tooth Fairy” killer. But, what is most interesting is Brian Cox’s take on Hannibal, with the name Lecktor re-spelled for some reason. His Hannibal keeps in tone with rest of the movie, played much more natural than over-the-top, while still keeping the character true to the novel’s interpretation. While still a great film, the focus remained away from the character of Hannibal, which served this movie probably for the better. The same would not be true for the rest of the series. Here we now have the groundbreaking movie that not only set the standard for the rest of the series to follow, but also became the genre defining title that helped put Dr. Lecter on the cinematic map. The Silence of the Lambs may not only be the greatest horror movie ever made, but also the best crime thriller and best detective story ever brought to the big screen; though that’s up for debate. There’s nothing in this movie that doesn’t work perfectly, from the direction by Jonathan Demme, to the outstanding and grim cinematography and art direction, to the career defining performances. Perhaps the reason why the movie works so well is that it fearlessly adapts Harris’ second novel in the series to the fullest extant, with all the macabre elements intact. Not only that, but it’s unafraid to go over-the-top as well, creating images that we the audience will never forget, as well as images we wish we could forget. Hannibal returns again (now played by Hopkins), this time is called upon by FBI rookie Clarice Starling (Jodie Foster) to help her track down a serial killer by the name “Buffalo Bill” (Ted Levine), who skins his victims before killing them. Lecter and Sterling form an unlikely bond over the course of the story, somehow gaining each other’s respect because of their intelligence. Even when Lecter makes his horrifying escape from prison, she knows immediately that he’ll never come after her, because he would “consider it rude.” It’s that bond between the characters that ultimately elevates this film above all others, and thankfully the movie exploits every element of the characters’ progression to the fullest. Hopkins’ over-the-top performance as Lecter is phenomenal and is perfectly complimented by Foster’s subdued work as Clarice. Both actors deservedly won Oscars for their performances in this movie, and the film itself accomplished the impossible feat of being the first horror flick to ever win an Oscar for Best Picture. Because of the popularity of The Silence of the Lambs, demand was high for a sequel to both the novel and the movie; which is funny considering that some people view Lambs itself as a sequel to Manhunter. Still, Thomas Harris released his follow-up novel in 1999 under the name Hannibal, and Universal pictures quickly put the film adaptation into production with top tier talent involved. Jodie Foster declined to return as Clarice Starling, but she was replaced with well respected and Oscar-nominated actress Julianne Moore. Hopkins thankfully returned to the role that he came to own as Hannibal and direction was given over to one of Hollywood’s greatest visual artists, Ridley Scott, coming off of his huge success with Gladiator (2000). The screenplay adaptation was done by none other than David Mamet (Glengarry Glen Ross) and Steve Zallian (Schindler’s List), and the cast was rounded out by big names like Ray Liotta, Giancarlo Giannini, and an un-credited Gary Oldman as a man without a face. With all this amazing talent assembled, how could this movie possibly fail. Well, it did; critically anyway. The movie was still profitable, but almost immediately it suffered a strong backlash from critics and fans alike, saying that the movie failed to capture the brilliance of Lambs and instead focused way too much on the gory details of the original novel without purpose. Indeed, the movie is a failure in adaptation and execution and that’s partly due to director Scott not being a good fit for the material. The movie does look pretty, but there is no meat to the plot at all. The tone is unfocused, and that’s mainly because Scott put too much emphasis on showing the gore in the movie. Lambs and Manhunter proved that less is more, because it helped to make the shocking moments stand out better and have more impact. Hopkins is still great as Hannibal though, and it is a treat to watch him here. If only the rest of the movie was worthy of his performance. Only a year and a half after Hannibal had alienated audiences and readers alike, Universal quickly released this follow-up which again returned Anthony Hopkins to the role as Dr. Lecter. Made almost as an apology for the previous film, Red Dragon was a return back to basics for the series, using The Silence of the Lambs as it’s source for inspiration. Strangely enough, instead of moving forward with more sequels, this movie actually takes us back to the beginning, adapting the first Hannibal Lecter novel of the same name, which was also the source for Michael Mann’s Manhunter. Some may think that it was a cheap way to keep an already waning franchise going, but by taking the remake route instead, the end result proved to be surprisingly effective. I think the biggest reason why this movie worked as well as it did is because the screenplay was adapted by Lambs scribe Ted Tally, who has proved better than anyone that he’s the best person out there to capture the mood of Harris’ novels in a cinematic form; other than possibly Hopkins that is. Also, the supporting cast helped out a great deal as well, with big names like Edward Norton, Harvey Keitel, Philip Seymour Hoffman, Emily Watson, and Ralph Finnes all filling out the roles. Brett Ratner has had a shaky reputation as a filmmaker, but here he actually delivers well enough direction to make the movie work effectively. If the movie has a flaw, it’s that it’s trying to hard to be just like The Silence of the Lambs. Not that the movie is trying to be a knock-off, but it unfortunately causes the film to lack any identity apart from it’s predecessors. By using the same sets as well as similar lighting and cinematography, it’s almost difficult to watch this movie and not feel like you’re also watching a scene left on the cutting room floor from Lambs. The movie still works as a whole, but the fact that it’s still reminding you of a superior film is a detriment nonetheless. But, at the very least, it gave us yet another oppurtunity to watch Hopkins at work, and it did blow some of the stench off of the series after Hannibal failed so miserably. Prompted by a threat from uber-producer Dino DeLaurentis that he would make another movie about Hannibal Lecter without the involvement of the author, Thomas Harris quickly drafted yet another Hannibal novel, only this time focusing on the character’s youth and origin. Naturally a film adaptation followed, but what is interesting this time is that Harris took it upon himself to do the adaptation of his own novel for the screen. Although Harris is a remarkable and peerless novelist, screenplay adaptation is a whole different style of writing, and this movie definitely shows Harris’ amateur status in this field. The movie is very dull, lacking all of the macabre Grand Guignol excess that helped to define the series in the previous installments, and instead it feels like a grim period drama rather than a horror classic. Though there are some horror moments thrown around here and there, none are particularly noteworthy. It also lacks the presence of Anthony Hopkins, who obviously couldn’t play the role this time, considering that the film focuses on the character as a young man. Instead, we get young French actor Gaspard Uliel in the title role, who has the evil stare of the character down, but none of the same charisma. At this point in the franchise, it was clear that the character was played out, and even Thomas Harris was ready to let the character go. This film was only prompted as a way for the original author to still keep control over the development of his most famous creation and nothing more than that. So, in the end, it was still a positive exercise for Thomas Harris. If only something better had come out of this other than an obligation of a movie. It may be the final time we will ever get to see any new cinematic adaptations of the Hannibal Lecter, and it’s sadly a lackluster and forgettable way for such a great character to go out on. 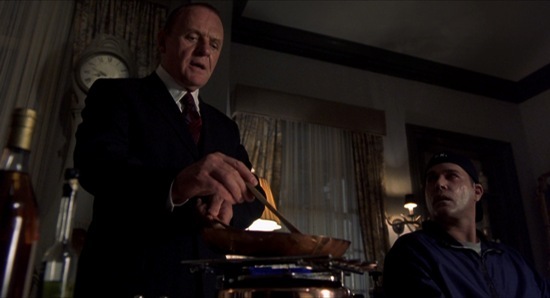 Overall, the Hannibal Lecter series has a pretty turbulent record in quality, with one truly great masterpiece of a film, along with two pretty solid adaptations of the same story and two truly terrible sequels around it. But then again, which horror franchise can you recall having as much an impact as this one. The Silence in the Lambs in particular redefined all notions of what makes a movie a Horror film. Parent studio Universal even was apprehensive about calling it a horror movie, instead calling it a “psychological thriller” in the hopes that it would gain more prestige from critics who usually looked down on the Horror genre. In that respect, it probably worked, but Thomas Harris and director Jonathan Demme clearly stated that they intended their work to be considered part of the Horror genre, and indeed that argument has proven out over time, no matter what Universal says. And this is largely part to the building of a franchise that has truly embraced it’s gruesome nature. Michael Mann’s subdued take on the material is commendable, as is Brian Cox’s performance as the Doctor, but we all know that no one else brought out the best in the series better than Sir Anthony Hopkins. His performance in Silence of the Lambs is truly one of the all-time greats; milking every ounce of potential out of the character and making it seem like a lot of fun at the same time. It’s a performance that managed to redefine the way serial killers are portrayed in movies, and it’s often imitated but never matched. 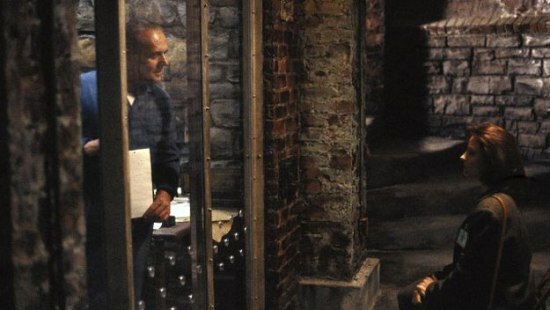 How many scenes do you see now in movies where the main villain toys with his captors through a glass wall prison cell. That’s all thanks to this series. Harris’ novels and the film adaptations remain influential to this day, influencing everything from X-Files to True Detective, and has even spawned a critically acclaimed series on NBC. And it’s all thanks to the charming cannibal at it’s center, who I’m sure would feast on all of this popularity with some Fava beans and a nice Chianti. Enter renowned comedy filmmaker Kevin Smith, who’s become noteworthy not just for his canon of flicks, but for being a unique personality both on screen and on social media. After his film career turned a little rocky in the late 2000’s, bottoming out with his horrible experience directing 2010’s Cop Out, Smith turned his attention away from Hollywood and towards a new passion, which turned out to be his weekly podcast. What started out as a modest show where Kevin and his buddies could discuss topics freely in humorous, unhinged discussions soon developed into a vast network of multiple shows, and soon Kevin Smith’s “Smodcast” became a launching point for a new phase in Kevin Smith’s career as a filmmaker. With a wide reaching show like his, he could promote his new projects in ways that he was never able to before, which became helpful when he decided to abandon the traditional route of film marketing to promote his 2011 film Red State. But, what he soon learned on his podcast was that he was able to generate new ideas for stories and actually go directly to his audience for feedback, knowing that most of his fans were indeed already listening in. This was something that happened during an episode of his Smodcast called “The Walrus and the Carpenter,” where he and his longtime producer and co-host Scott Mosier discussed a bizarre article they found online, about an ad put into a British newspaper inquiring for a new roommate to help a person with their rent and care-taking. The catch; the new tenant had to wear a walrus costume at all times. This of course spurned on Kevin Smith’s imagination and the whole episode of the podcast involved Kevin and Scott playing out that scenario in a hilarious but twisted way. This was in no way different than most of the many other discussions Kevin and Scott have had on their show, but what made the episode special was the fact that Kevin saw potential in the idea. Indeed, within the same episode, Kevin Smith wondered if he could actually make the movie that they were dreaming up on the spot. He knew he had the means and the connections to make it happen, but what he didn’t know was whether or not he should. So, he asked his audience to go to Twitter and let him know specifically if he should make the movie or not; all they had to do was either tweet #Walrus Yes or #Walrus No. Not surprisingly, nearly everyone who follows Kevin Smith tweeted in the affirmative, and Smith didn’t hesitate to make good on that promise. He quickly drafted a script, got the funding and the cast lined up in no time, and within a years time, he had a film ready for the spotlight. And indeed, every weird thing that Kevin and Scott jokingly dreamed up on the podcast made it to the screen, in every disturbing and hilarious detail. The final film itself, Tusk (2014) may not be anything groundbreaking on the surface, but the fact that it came from such an unexpected origin is what ultimately makes it groundbreaking. Had Kevin Smith not put the idea up to a vote on his Twitter page, the movie would never have been made. This is what makes the existence of Tusk so interesting because it is 100% a film motivated by social media. It’s not just another film that uses Twitter as means for promotion. We wanted to see this movie happen, we used social media to make it happen, and now it’s playing nationwide in our local cinemas. Kevin Smith’s savvy-ness with social media may have given him a fun exercise in film-making, but the means to make it happen may be more groundbreaking than anyone realizes. Back in the early days of Hollywood, the only way that audiences could influence what came out of the entertainment industry was to speak with their wallets. If a film was bad, audiences could just ignore it, but after a while, Hollywood found a way to work around this and they used marketing tricks to make even their most inferior products sell well at the box-office. Trends would come and go with the passing years, but whatever films were being made were still dictated by the aspirations of the directors, the producers, and/or the studios. The audience never could have a say in what stories they wanted to see; it was merely down to the choices of whatever films were available at the moment. Thankfully there’s so much variety out there in the film market that anyone could still find something that interests them at their local cinema, so it’s not like audiences have been cheated by this system. But that prompt to have a say in what films actually get made has been largely been left out of the public’s hand. Instead, the choices made by Hollywood have been more about guessing what audiences want than actually knowing what they want. Indeed, even with social media being as widespread as it is now, it’s still difficult to gauge exactly how everyone will react to something. Back in the early days, the studios would sometimes rely on polls and surveys to see what audiences wanted in their movies, but polling only reaches a handful of people and it’s mainly slanted one way or another depending on how the survey’s were conducted. Also, Hollywood has made the big mistake of having focus groups and test screenings determine some of the final cuts of films, which again is relying on a very narrow margin of people to influence and compromise someone’s vision. The reason why Tusk is groundbreaking is because it removed the guessing game part of the equation and puts the idea up to audiences before any movement can be made on the film at all. Kevin Smith’s fanbase spoke up and indeed said that “we want this to happen,” and the rest was up to Kevin to fulfill. He didn’t have to test screen the footage to see if it would appeal to a wider audience, or get rebuffed by studio executives who thought the idea was too bizarre to be made. Here, thanks to the response on Twitter, Kevin Smith had the voice of the audience behind him, telling him directly that this story needed to be told. Indeed, by letting the audience in on the process at the very beginning, you have this ability to get people behind it early and generate excitement for it before it even sees completion. It actually works better that way than any kind of marketing, although that certainly helps as well. And it thankfully let’s audiences know what to expect and not feel like they were duped by the studios into feeling excited for something that didn’t deserve it. 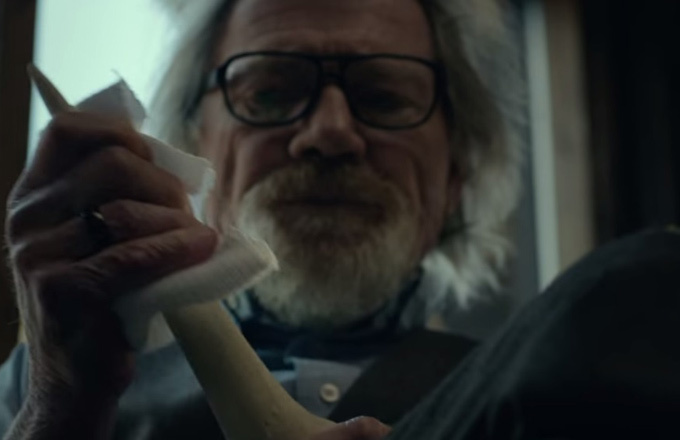 People know what to expect with Tusk, because they’ve been following Kevin Smith’s whole journey with it. In fact, the whole lead up to the movie’s release, documented through Kevin Smith’s own correspondences on Twitter and his podcast, has helped to generate even more interest in the film. Though Kevin Smith may have just wanted to connect with his audience for some well intentioned feedback, he may have also started a whole new trend in film marketing that studios may be following in the years ahead. Though Tusk came about through an already built-in brand that it’s already famous creator has built over the years, it does show how some underground film-making can use social media to help gain exposure for their products. This is something that has been growing over the last few years and independent film-making is seeing new life today thanks to new forms of crowd-source funding that has also arisen from social media. Today, websites like Kickstarter and Indiegogo are allowing filmmakers who have visions that exist outside the norm find the funding they need in order to make it a reality, and it’s all made possible by getting the word out directly to the audience. The great thing about the crowd-sourcing trend is that it puts the power directly into the hands of audiences to actually make a movie happen. For most filmmakers, finding the funds is the hardest part of the process, so by going online and soliciting funds from the fans directly, with perks like screen credit attached of course, they are able to bypass the whole process of trying to woo less interested investors. Though many films like these will be micro-budgeted even with strong fan response, it nevertheless will give the audience a financial say in what they want to see. Sometimes, when the fan-base is strong enough, a film will get the funding it needs in a big way. Take for instance the Kickstarter fund set up for the making of a movie based on the series Veronica Mars. The Veronica Mars movie managed to raise $4 million in a short amount of time, and with that show of goodwill from a dedicated fan-base, the production team wasted no time making the movie a reality. That’s one example where a film that could never have gotten made the old-fashioned way, due to lack of interest in the industry, suddenly became possible due to the financial support of it’s own fans. Although there are many benefits to programs like Kickstarter to help fledgling filmmakers get the funding they need or help unique voices be heard outside of the system, there are still drawbacks to audience driven productions. When filmmakers take to Kickstarter, they need to be sure that they are listening to their audience, and not just using the site as a means for some easy cash. If audiences are investing in something, it’s because they want to see something very particular, and not just what the filmmaker believes the audience deserves. Like with more high profile investors, filmmakers have to be beholden to those who invested money into their projects, including taking in creative input that those same investors suggest. When your film comes from thousands of investors like it would from crowd-sourcing, the same should also apply. This probably matters little when the movie that is getting funded is bringing an already familiar property to the big screen, like taking the Veronica Mars series and turning it into a film, but when the film is something new, the filmmaker owes it to their audience to include them in on the creative process. Filmmaker Spike Lee ran into trouble recently when he took to Kickstarter as a way to fund his next film so that he could avoid having to appeal to studio investors. The complaint from audiences came from the fact that Lee was using crowd-sourcing as little more that means to fund his movie, and that he was still going to do things his way without the input from his fans who invested their money in it. It could be said that just by funding the movie, the audience would have already spoken out on supporting Spike Lee’s project, but even still, one has to recognize that there’s more to that process than just finding a quick source of money. Kevin Smith’s Tusk had the benefit of coming from a filmmaker who indeed had the connections and was listening to what his audience had to say. Though Kevin Smith’s movie may be a small oddity, it nevertheless provides us with an early outlook at how movies may be developed, produced and sold in the future. Today, audiences now have more say in what kind of movies get made than they ever have had before, and it’s all thanks to the new advances made in social media; and also thanks to people in the media who understand how to use those tools well. Not only are we getting filmmakers emboldened with new avenues of finding ways to reach their audiences, but the audiences themselves are beginning to also strong-arm the filmmakers into making the movies they’ve always wanted to see. Even rumors are now influencing film-making decisions, as some people in the media are using places like Twitter to gauge public reaction to potential film ideas before they even exist. Not long ago, word spread online that Disney was working on a third Father of the Bride movie that was centered on gay marriage. While this caused an uproar almost immediately, it was revealed later that no plans of any kind were being made by Disney on such a project, but because the feedback on the rumor was so strong, there is actually real development now on that idea that could potentially see the light of day if the curiosity remains out there. That’s a kind of audience power that has never been seen before, and it will probably spurn on development for movies in the years ahead that may have struggled to get off the ground before. If there’s an audience out there for it, those movies will be made, and social media has helped to make that link between audiences and filmmakers that much stronger. Time will tell if it leaves a lasting impact on film production as a whole. I know for one thing is that something like Tusk could only have become a reality because of this special link. The Criterion Collection has given us solid editions of movies that are either universally renowned or completely obscure, and has used it’s label as a mark of quality for the films in it’s library. But, while many of the films that make it into the Collection have garnered attention because of their lack of exposure, either being from a foreign market or were little seen outside of some artistic circles, there are some instances where Criterion shifts it’s focus back to Hollywood and brings our attention to a movie that demands our attention. Sometimes it’s an important but overlooked benchmark film in a genre that deserves the Criterion label, like Howard Hawks’ Red River (1948, Spine #709) or a curious Hollywood oddity like the Charles Laughton directed The Night of the Hunter (1955, #541). But other times it’s films that were overlooked in their day that have stood up remarkably well over time and became more relevant that get the Criterion treatment. That has been the case with a lot of surprisingly prescient films like Fritz Lang’s M (1931, #30), which looked at the dangers of vigilante justice in a pre-Nazi Germany, or Michael Powell’s Peeping Tom (1960, #58), which explored the nature of voyeurism and how human privacy was more fleeting than we would’ve like to have believed. And then there are some films that would have certainly been deemed a classic in their day if they had not been overshadowed by other films at the time. This was certainly the case with a movie called Ace in the Hole (1951, #396), directed by the legendary Billy Wilder. Ace in the Hole is a movie that has thankfully been given new life as part of the Criterion Collection, and having rediscovered it as a part of the catalog, it’s a mystery as to why this movie has gone unnoticed for all these years. Part of the reason why Ace in the Hole has largely been overlooked is because it was sandwiched in-between two of Wilder’s more successful and renowned films; 1950’s Sunset Boulevard and 1953’s Stalag 17. These movies are now considered among the director’s all time greats, while Ace is seen more or less as a quieter exercise between the two. That, however, is how the original audience reaction painted the reputation of this movie, and it should not reflect on the quality of the film itself. In fact, I believe that Ace is just as good as these more famous titles; if not better. It’s just as unforgiving in it’s satire and themes as Sunset Boulevard, and it probably works better as a film today than it did in it’s first run. Billy Wilder was no prophet, but he certainly could pick out a troubling trend in American culture and exploit the hell out of it. In this case, the subject of ridicule was tabloid journalism, and the way it can be carried out of control. Now, back in the early 50’s, sensationalizing the news was not something that anyone saw as scandalous, and Wilder’s take on the issue definitely exaggerates things to the very extreme. But the sad fact is that over the years, tabloid journalism has become so extreme and out of control, that it has actually caught up to Wilder’s absurd predictions, making his Ace in the Hole all the more prophetic. This is probably why Criterion chose to spotlight this particular film, and I’m glad that they did. 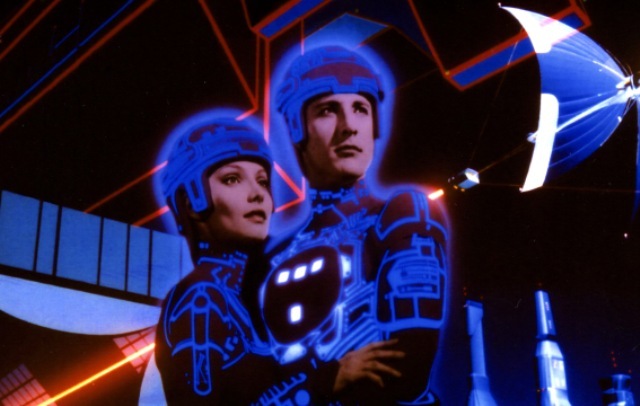 It gives us all a chance to take another look at this strangely prescient film and help it to become one of the great Hollywood classics as we now reexamine it through the knowledge that we have today. The movie follows the story of Chuck Tatum (Kirk Douglas), a big-city journalist who has fallen on hard times. He reluctantly takes a job as reporter in a small New Mexico town. He finds the new surroundings pretty dull compared to his old life, but that changes when he gets word of a cave-in at a local mine. Not one to lose an opportunity Tatum quickly investigates and he soon learns that a miner has been trapped within the cave-in, unable to free himself out of the rubble. Tatum quickly relays the story not just to his own newspaper, but to all media sources across the country. Soon, national attention is brought to this small town story, with Tatum leading the charge. Tatum soon learns that the rescue mission can be accomplished in less than a day, but through a little bit of coercion and some bribing of the local officials in charge, he manages to slow and extend the rescue mission over the following week. He even uses his wit and charm to convince the miner’s estranged wife Lorraine (Jan Sterling) that this is the right thing to do. As the story gets bigger with every passing day, so does the crowd reaction outside of the mine. The whole scene soon becomes a circus, both figuratively and literally, complete with a ferris-wheel at the mine’s entrance. But, reality starts to set it when the trapped miner’s condition starts to deteriorate, and it dawns on Tatum that he made the problem worse by trying to satisfy his own ends. Once the miner dies in the cave, Tatum is faced with the fact that he now has blood on his hands and must now deal with the chaos that he created. The remarkable thing about a movie like Ace in the Hole is that it is both absurd and yet wholly realistic at the same time. Billy Wilder was always a master at highlighting the follies of mankind, whether it was for a laugh or for a moment of sharp insight. He managed to make that work in dark films like Sunset Boulevard and also in lighter ones like The Apartment (1960), and always with unparalleled wit. 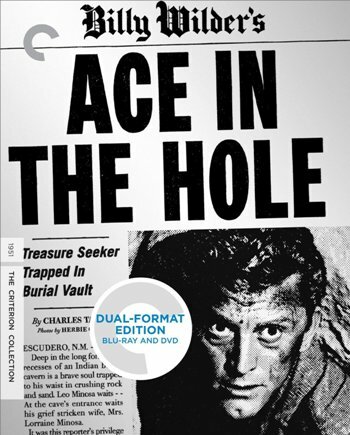 Ace in the Hole came out right after Sunset Boulevard and it’s very much in the same vein. Both films deal with unchecked human vanity, and how it consumes the lives of not just their selected main characters, but also the lives of everyone around them. Chuck Tatum is a perfect example of this kind of archetype; a man so consumed by his own ambition, that he loses all sense of the consequences of his actions. Not only that, but he does so with a righteous fervor, believing that what he’s doing is the right thing. The scariest aspect of the movie is just how quickly people succumb to the same kind of media frenzy that surrounds Tatum’s crusade; with absolutely no one raising an alarm as to the unethical practices going on behind the scenes. One doesn’t have to look far to see the same echoes of this today in our own media culture whenever there is a celebrity on trial or a political scandal being exposed. Eventually, the stories becomes less about informing people, and more about covering every minuet detail, trying to drag a story out long after it’s relevance is spent in order to hold onto the audience longer. Wilder saw this as a potential issue back in the 50’s and it’s a sad reflection on our culture today that his absurd analysis has actually proven out over time. But, apart from what it has to say, this isn’t the only thing that has made Ace in the Hole a honored addition to the Criterion Collection. It’s an excellently made film as well; just like most other Billy Wilder films. The writing in particular is very strong, which comes courtesy of Wilder himself, and his co-authors Lesser Samuels and Walter Newman. Every character is given sharp-witted dialogue, but none of it feels inauthentic or too cinematic. Kirk Douglas in particular does exceptionally great work here, but then again when has he ever disappointed. He makes Chuck Tatum a very fascinating scoundrel and a character that’s both hard to like and dislike. Though inspired by many of the overzealous journalists of the early 50’s, you can definitely see the pomposity and full-of-themselves vanity of Chuck Tatum in modern day “journalists” like Keith Olbermann and Bill O’Reilly, which just shows how well Douglas’ work here has held up. The remaining cast works well too, like Jan Sterling’s conflicted Lorraine, and Robert Arthur as Tatum’s idealistic assistant Herbie, who captures the effect of Tatum’s manipulations on the impressionistic young journalist frighteningly well. Wilder’s direction is also top-notch here. He manages to get the message of the story across without ever banging it into the audiences head. Small visual cues, like the “Tell the Truth” sign in newspaper’s office, helps to slowly build the story’s morals over time, allowing them to sink in before the climatic blow reaches us. Overall, it’s easy to see why this movie has made it into the Collection. Like most other Criterion titles, Ace in the Hole has received a world-class restoration, helping to bring out the best quality in the movie’s picture and sound. Though the film’s original elements were easy to find in the Paramount Pictures’ archives, there still had to be a lot of work done on restoring it to it’s full original glory. Given that the movie wasn’t as universally renowned as it’s predecessor Sunset Boulevard, Ace unfortunately deteriorated over time and Criterion’s restoration team did a great amount of work to get the picture up to today’s standards. Seeing the film now on blu-ray, it’s clear that their hard work payed off, because it looks just as good as any other classic film from it’s era. While there are still imperfections in the picture, they are more likely the result of the original limitations of the film stock, and not at all a reflection of the quality of Criterion’s restoration. It should be clear that Billy Wilder was never a stickler for visual purity; he was just a good enough visual director who focused his films more on the dialogue and the performances, so the fact that Ace in the Hole looks as good as it does here should tell you how well Criterion’s team did. The black and white contrast is well balanced and the detail really shines through on the textures. Just take a look at the scenes in the desert around the mine to really appreciate the high-definition picture on this blu-ray. The restoration to the mono soundtrack also feels genuine and helps to support the film as well. The carnival atmosphere during the latter part of the film in particular pops out in the soundtrack as you watch the movie. Overall, another quality effort from the Criterion team on a film well deserving of a polished restoration. The bonus features also help to highlight the significant reputation that this movie has built over time. First off is an audio commentary track from film scholar Neil Sinyard, who helps to break down the film’s social themes as well as it’s place in media history and within Billy Wilder’s own filmography. It’s a bit of a dry lecture for cinephiles, and may not be for those who want to hear a more detailed analysis of the making of the movie, but Sinyard’s comments are still informative and worth giving a listen. The biggest feature on the set though is a full length documentary called Portrait of a “60% Perfect Man“: Billy Wilder (1980). In it, director Wilder is interviewed about his career and his methods of film-making, complete with relevant clips from some of his most notable films, including Ace. The documentary shows just how funny the man was in person as well as his passion for film-making and it works as a fantastic overview of the works of one of Hollywood’s most legendary and original voices. An excerpt from Billy Wilder’s 1986 appearance at the American Film Institute is also included, which while not really relevant to the film itself, is nevertheless an appreciated addition. Rounding out the extras are some very welcome archival interview clips from star Kirk Douglas and co-writer Walter Newman, both discussing their work on the film, as well as an appreciation clip from director Spike Lee, who has long been a fan and champion of this film. Also included is a behind-the-scenes photo gallery and an original trailer, and it all makes this a very complete and worthwhile collection of extras to help compliment the presentation of this feature. Ace in the Hole was a hard-sell in it’s time, and it’s probably the reason why it has been lost for so many years. In fact, for the longest time, the movie went by a different title, called The Big Carnival, which was a choice made by Paramount Pictures and not by Wilder. Billy Wilder thought that the new title was too on-the-nose for the film he made and took all the subtlety out of what he was trying to convey; but it was something that he didn’t fight the studio over, so the title stuck. Thankfully, when Criterion first released the title on DVD, they thankfully restored the original title just as Wilder had wished. Hopefully Criterion’s edition of the movie brings new attention to it. It really is amazing to watch this movie and see how many things that it predicted correctly about media culture and human greed. It makes a great companion film with Sidney Lumet’s Network (1976), another movie that was well ahead of it’s time dealing with the same subjects. Any student of journalism today should be required to watch both movies as a lesson in the ethical boundaries that they will inevitably face in their profession. 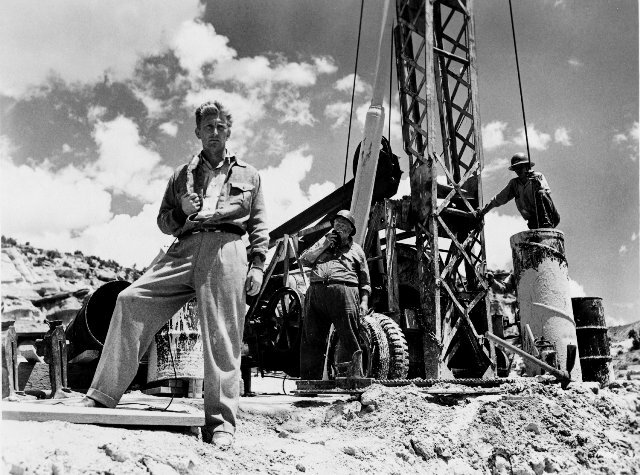 But, apart from that, Ace in the Hole should be seen by all as just a great example of film-making. It certainly stands as one of Billy Wilder’s best and most hard-hitting films and hopefully it will now earn it’s place as one of the director’s all-time greatest. I certainly would equate it with some of his better works and I am grateful that Criterion took the time to highlight this film too. It’s a movie well worth rediscovering and it’ll be curious to see how well it’s hard-hitting themes will hold up over time as the media circus that it predicted sadly becomes all the more common.